Wishing you success in all of your genealogical treasure hunts! That baby looks like a doll! Thanks for sharing friend! Awww so sweet!! 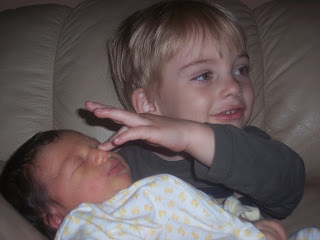 2 cutie pies! I finally took time yesterday to do something I have been wanting to do for awhile now. It has been several years since I started genealogy and blogging. Many cousins have been found. But, how many? Who? I have not kept any kind of system to log these cousin contacts. I was past due, do I even remember all of them? Well, that was the goal here. I started a spreadsheet of "Cousins Found." I titled columns with things like, phone number, address, email address, surname, how/where we made contact, and if I have met them. I am all about meeting my living cousins and their family members, it does my heart good, plus you never know how long they will be with us. Of course, they may also have information to help us in our genealogy research. Do you remember telegrams? Western Union Telegrams were a bit before my time. I have scanned the few that were kept and received by my paternal family back in the day. 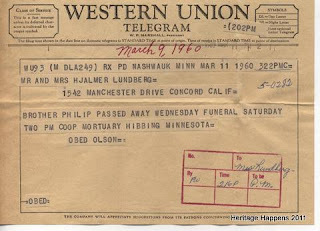 This telegram was sent to my grandmother from Obed Olson stating his brother Philip had passed away on Wednesday March 9, 1960. It also let the family know that the funeral services were to be on Saturday at 2:00pm at Coop Mortuary in Hibbing, Minnesota. The telegram was to be received by Friday (which would have been March 11) and the funeral with the funeral being the next day I highly doubt my grandparents made if from California to Minnesota for the funeral. Philip and Obed Olson were my first cousin once removed. Unfortunately, I never met either of them. I am following Tonia's Roots as she brings several GeneaBloggers through 31 weeks of working towards a better blog, prompts written by Darren Rowse. Ever run out of things to write about on your blog? If your answer is yes – you’re not alone. This weeks's task is to do an exercise that will identify a range of post ideas that you can use when stuck for an idea in future. The key with this process is not to put yourself under pressure to come up with completely new and out of the blue ideas for every post you write. Instead – this process taps into what you’ve recently written on your blog and helps you to identify ways to extend those ideas. Here’s the mind mapping method that I’ve used (note: I’ve talked about this previously so it could be familiar to some). At~myHeritageHappens dot com, I share my family history. I sort, learn, discuss, and analyze my family's legacy. At~myhhsinphotos dot blogspot dot com (my Heritage Happens in Photos), I will share photos I have taken. I hope you will enjoy both of these blogs by me ~ Cheryl Palmer. Contact info: geneaminded at gmail dot com.